Scouts are role models. They’re the epitome of brave and intelligent, leaders in their own right, trackers of multiple animals and chief survivors in the modern world. If you need something fixed, know that a former scout will be the best choice in anything you need help with. They’ve been around for a hundred years now, along with their iconic sashes and merit badges, complete with cheerful and polite attitudes. Scouting and their merit badge system are such common things to see these days that we tend to overlook their history. Scouts were a program designed to do just what it does–teach young children valuable skills. After the idea for a scouting program started in 1907 in Britain, the idea itself took the world by storm. By 1911, there were boy scout programs in half of Europe, including North America. And of course, along with the boy scouting troops of yesteryear came the merit badge system and the development of the embroidered patches that came to be known as merit badges. Scouting is based on the central idea of aiding young people in their physical, mental, and spiritual development. Because scouts have to wear a uniform, social status is thrown out of the equation, and everyone is dressed equally. Scouting instills a sense of individualism in its benefactors, and many of today’s leaders were once girl or boy scouts. Like many things in the 1900’s, the very idea of Scouting for the youth was born in Great Britain, from the mind of a man named Robert Baden-Powell. Powell devised the idea for scouting while he was a lieutenant general in the British army. While he was away from home, he discovered that teaching his men the skills and knowledge one would need to survive in the wilderness made his men less likely to blindly follow orders. They became more independent because they could think on their own and make decisions more efficiently than those without the training. He also enjoyed scouting in its own right, and wrote a small instruction manual called Aids to Scouting. Upon his return home, he noticed that there was a high interest in his manual by younger boys as well as men, and it was being used by some instructors and organizations. It was suggested to him that the idea of scouting would work just as well if he turned it into a program for the youth and removed the military backbone in it. So he proceeded to write a book about it, free of the military jargon, targeting the youth. At the time, the only real organizations to help youths grow were military driven, and these Powell believed to be unattractive ways to reach the end that he desired. So, together with his publisher Pearson, he prepared a speaking tour in 1907 to promote his new book, Scouting for Boys. Immediately after the book was published, the idea exploded. Between 1907 and 1910, the idea of scouting and the scouting program had spread to 21 other countries, who quickly developed their own youth-based organizations, and it only continued to grow. America picked up the scouting program in 1910, with the BSA (Boy Scout Association) taking root in the hearts of the citizens. Nowadays scouting can be found in hundreds of countries, all based on the original principals set forth in Powell’s book. Of course, you can’t have boy scouts without the female equivalent! As soon as the all boys scouting movement spread, there was, of course, immediate demand for a female division of the organization. Girl scouts came almost immediately on the heels of their male counterparts, and were headed by Powell’s sister, then later on his wife. Girl Scouts began as a group called the Girl Guides, and just like the boy scouts, they had a rule of hierarchy all their own. 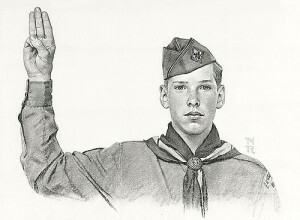 Boy scouts would go from Cub to boy, and then to Rover. Girls would go from Brownie to girl, and then to Ranger. These terms have also changed over the years, and vary between countries. In America the Eagle Scout is the highest honor for boys, while the highest honor for girl scouts is the Gold Award. Merit badges were born along with the very idea of scouting–in fact, they are one of the integral parts of the whole process. Based on the idea of military patches and rising rank, badges were awarded to scouts who had earned them after completing a series of tasks.. In America immediately after the scouting program began, fourteen embroidered merit badges were initially announced to the public, however none of these were ever produced or made. They acted as a kind of unfulfilled promise until 1911, when the official and original 57 badge designs were released and handed out to their worthy recipients. Out of those original fifty-seven, only eleven are still in use. They are: architecture, art, athletics, chemistry, first aid, lifesaving, music, plumbing, public health, and surveying. Only five of those were available in every generation of scout badges–architecture, art, chemistry, plumbing, and public health. Over the years badges have been retired or replaced, or added as the times changed. For example, the automobile badge was retired when driving a car became common practice, while Nuclear Science was added to when science had moved on from the 1900’s. Also, badges have been retired when they became less popular. The more popular badges consist of the required badges for one to collect in order to reach the rank of Eagle scout. One can also see the general interests harbored by scouts by seeing which badges are more popular, and which fall to the bottom of the list. Badge collecting is a popular hobby amongst former and non-scouts, especially if they come from an older time. There are type classifications–different designs that the badges went through over the years, and they have been labeled Type A through K, with each letter corresponding to a different badge design. Since 1986 badges have been produced with assigned numbers so that they can be more easily catalogued. There are hundreds of badges that scouts can earn this days, many more than the original fifty-seven. Every year new badges are considered and thrown out, and every year the scout program moves forward, teaching children valuable skills and life lessons in a safe environment. Today scouting remains a useful skill, and a wonderful way to teach a child to work well with others and grow as an individual. So keep up the good work scouts! We’re all proud of you!